Workers at the bailed-out trust report low pay, outsourcing and intolerable workloads. Seven unions with members at the London-based Academies Enterprise Trust (AET) have to halt all cuts and outsourcing to allow for last ditch talks at conciliation service ACAS, following opposition to Trust plans. Unions say AET have refused to engage in ‘meaningful negotiation’ over issues including the outsourcing of school services, holding down teacher pay progression, a failure to tackle excessive workloads and cuts to frontline school support staff. AET recently received a bail-out from the government amid financial difficulties – yet unions say the Trust are refusing to disclose information on the financial situation with teachers. Questions are now even being asked in Parliament about a recent funding deal and the lack of transparency around it. “The ESFA has agreed to provide up to £16.1 million in recoverable and non-recoverable deficit funding to support the turnaround plan of the Academies Enterprise Trust (AET), covering 2017-18 to 2020-21. £1.2m of that money is ‘non-recoverable’ deficit funding, according to a later government response. At the same time, pressures on staff are growing. The GMB union say some have seen their workloads expand to the extent they are becoming ill.
AET is responsible for some 60 schools across the UK – including ones in London, Birmingham, Leeds,, and Bristol. In 2017 AET cut dozens of jobs in a bid to slash £1.4 million from its schools’ estates budget – which unions say put children’s safety at risk. 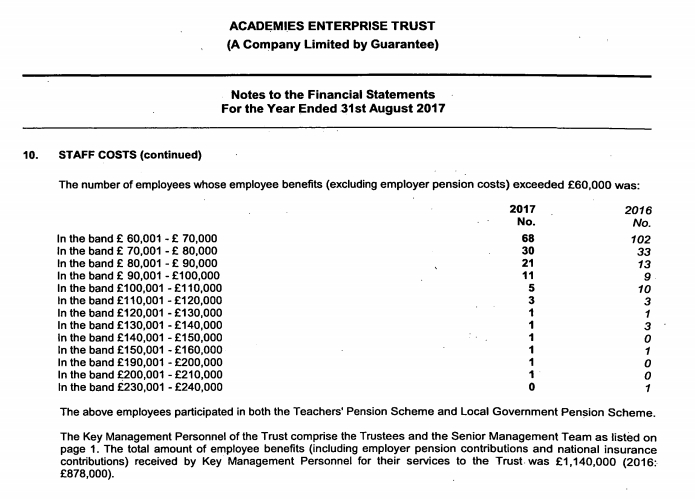 Yet the Trust’s accounts for 2017 show that 14 senior members of staff were being paid over £100,000 – including three paid over £150,000 a year. AET were among several trusts criticised for high executive pay by the Chief Inspector for schools in 2016. The group had a a reported net worth of £360m in 2017. The chain grew rapidly to run 74 academies, but had to offload eight schools from December 2014 to April 2015 after government intervention, Schools Week reports. It will stripped off a two in 2017 and another two last year. The removal of two of the trust’s schools followed pressure from Tory MP Therese Coffey, who set up a petition for Felixstowe Academy to taken off the Trust. 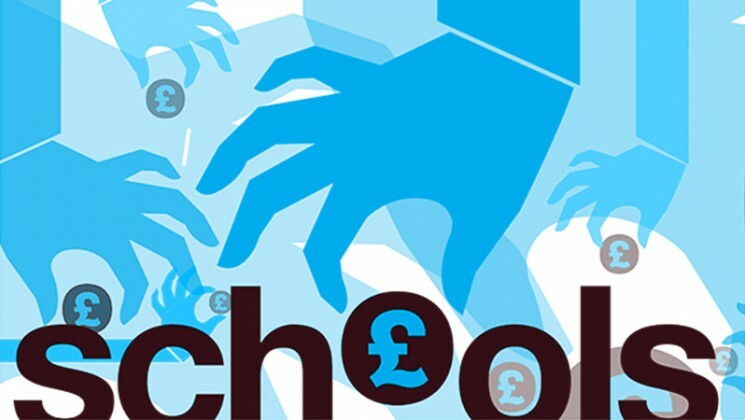 “The trust’s increasingly reckless approach to running its schools is a huge cause for concern. “Cuts have placed intolerable pressure on support staff and the effects are being felt in the classroom. “The negotiating environment has deteriorated over the past year as AET races to the bottom. “Teachers’ pay progression is one of the lowest in the sector, IT staff are being outsourced with few guarantees and staff workload is a severe problem. Academisation is a form of privatisation in itself. How long before academies start producing profit and loss accounts asking parents for fees and not voluntary contributions? Academies are ‘supervised’ by the DfE through their bureaucrats known as Regional Schools Commissioners who are not unknown to end up in plum jobs at multi Academies Trusts – like Future Academies Trust who recently took over Barclay School Stevenage against the expressed will of parents. Lord Nash and his Wife run the MAT. He was a minister of state responsible for the academies programme and is a big donor to the Tory Party! Labour must re-nationalise state education!